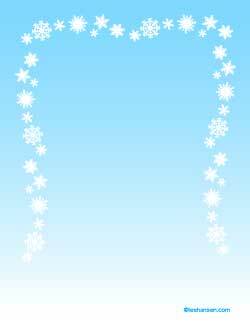 Cool blue background printable paper with snowflakes border design. Use this printable border paper to design a flyer or scrapbook page, write a letter, or print out your family newsletter. Each full sheet PDF printable letter paper sheet fits on a standard 8.5" x 11" page of paper. If your printer supports borderless printing this design will print the blue right out to the edges of the paper. For regular printing, center the page on the sheet of paper and scale to fit.